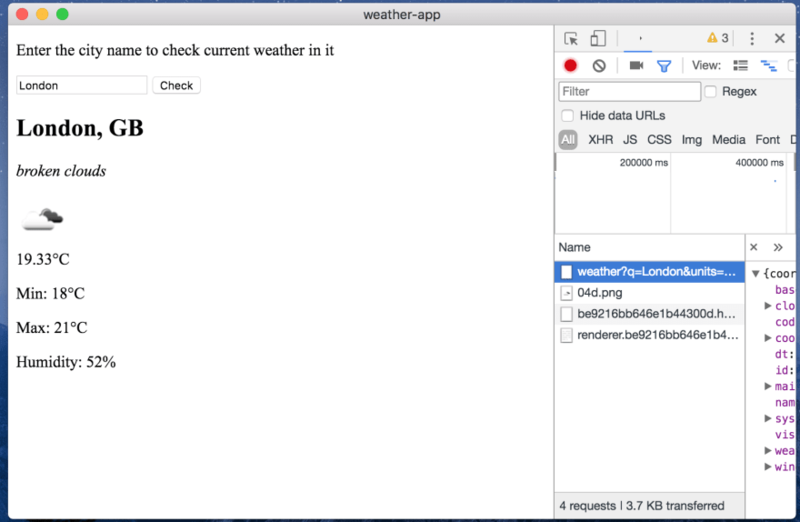 In my previous article I described building a desktop application with Vue framework using Vuido. It's a great library to create a fast and small-sized desktop app with native platform components but it has its own downsides like no CSS styling or images support. Now it's time to try Electron to build a desktop app. To have a quick start I've used an electron-vue boilerplate by Greg Holguin. It provides a developer with vue-cli scaffolding, common Vue plugins, packager, testing, devtools, and other features. 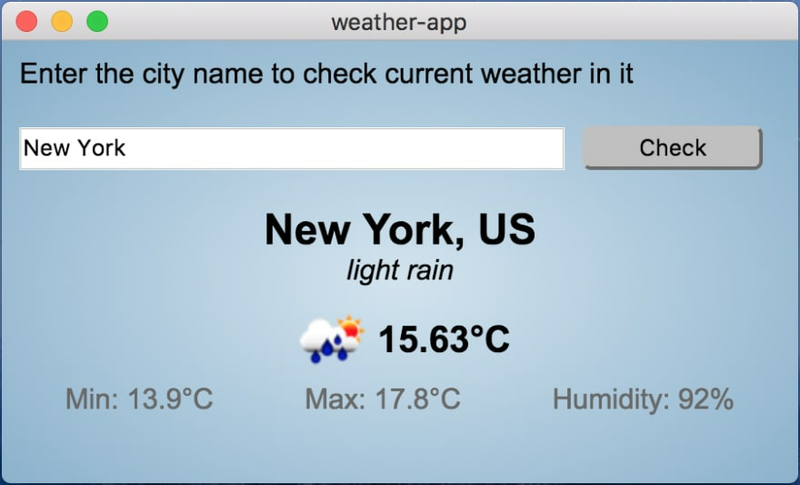 We will build the same application as in the previous article: an app to check the weather in the city of user's choice built on top of OpenWeatherMap API. If you want just to check the final Electron-powered app code, it's here. This will start an installation project with a couple of choices you need to make during it. The cool thing is if you need some commonly used plugins and libraries such as axios, you can pick them up during the installation process. I decided to google it and found this useful thread on StackOverflow. According to it, electron-builder seemed to be a better choice for me, so I went with it. 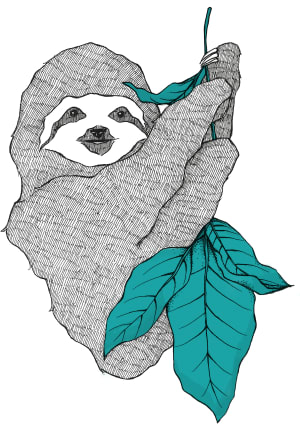 After the project is set up, you need to go to the application folder and run npm install or yarn install and we are ready to go. According to electron-vue docs, in Electron the process that runs package.json’s main script is called the main process. The script that runs in the main process can display a GUI by creating web pages. There are two files in the main folder: index.js and index.dev.js. First one is your application's main file, the file in which electron boots with. It is also used as webpack's entry file for production. All main process work should start here. index.dev.jsis used specifically and only for development as it installs electron-debug & vue-devtools. You don't need to touch it while developing an application. renderer folder is required for renderer process. 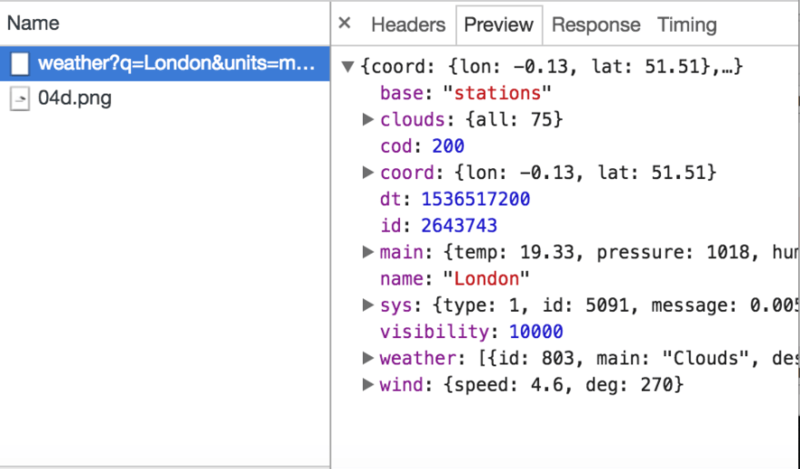 So there is a landing-page component and also devtools opened. Now we can start to change it! 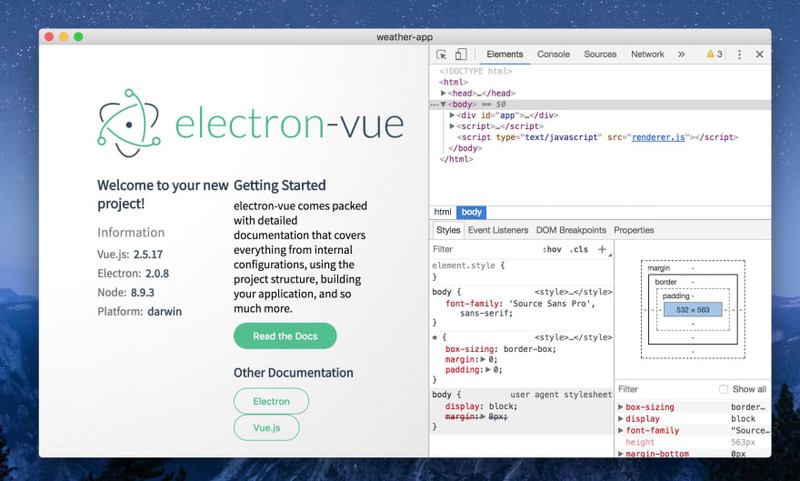 Unlike Vuido, an Electron-powered app is built with HTML-tags, not native components. So we will make a structure similar to the usual web app and style it with CSS. NOTE: I didn't install any CSS framework or component library on purpose: I wanted to compare package size without adding any different dependencies. The only library used in both projects is axios. We have a query property in data to handle the user input and we will make an API call with this query as a parameter. I've added one additional property comparing to Vuido version and it's an icon. 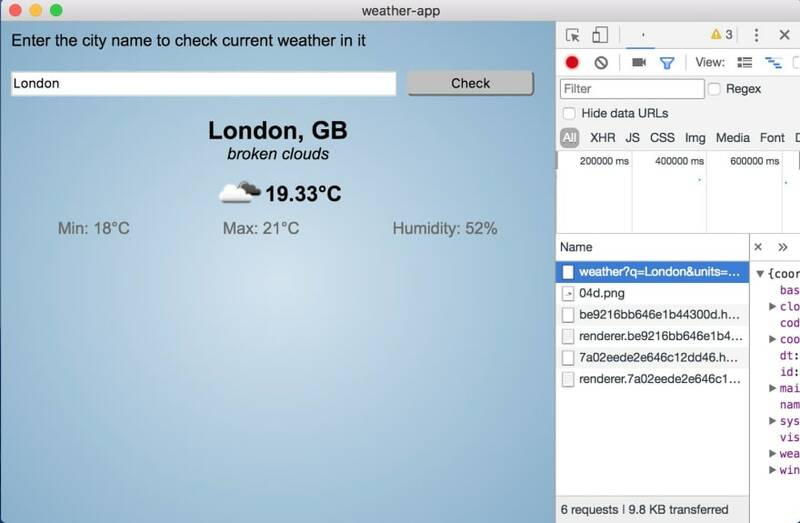 API provides a weather icon but we couldn't use it in Vuido app because currently there is no support for displaying images. Awesome, we can see an actual weather! But it looks like it's 1999... Let's add some CSS magic to it (actually, a lot of CSS magic)! 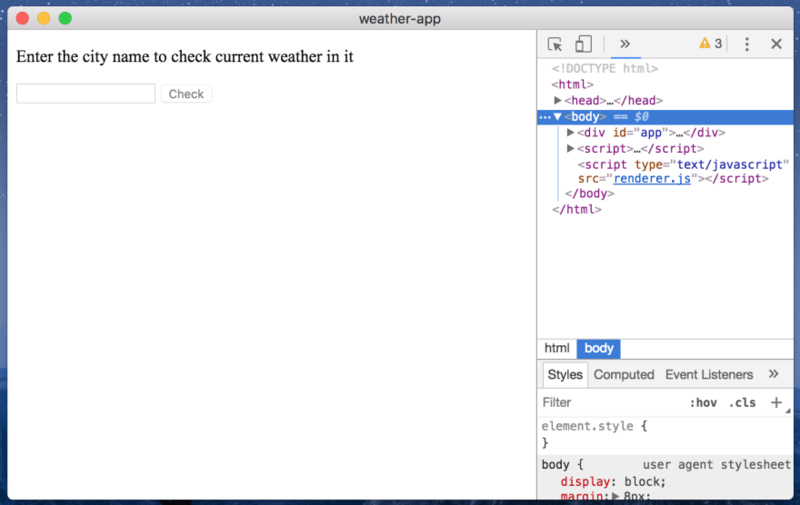 Great news: you can build your app as a web application! If you run a build:web task, you will find a build web app in a dist folder. But let's go back to our desktop app and run build task. 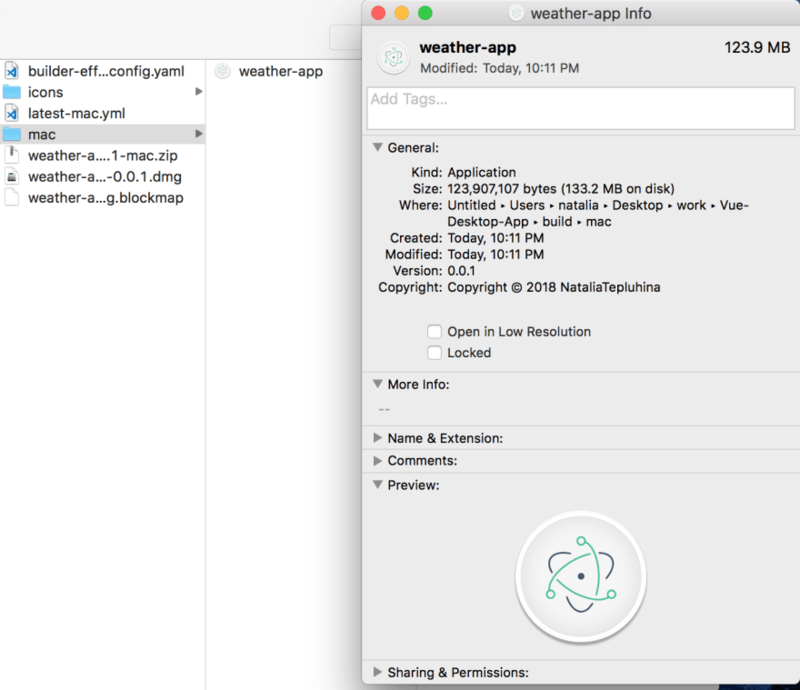 As a result, you will have a folder named after your platform inside the build folder (for me it's mac) and an application file inside of it. And its size it... wow, 133 Mb! It's a lot for such a little application! Also, if you try to run it, you can notice it's starting a bit slower than a Vuido-powered app. Electron-vue is a good option if your application needs a unique appearance and you care less about package size and performance. After it's done you will have two additional npm tasks: serve:electron and build:electron to work with a desktop app. I feel like Vue + Electron may become a really popular approach for developer experience. Hard to beat this productivity. I hope Electron has a plan for being kind to WebAssembly to improve performance and resource management in the future. I agree. Development experience is great, but the resulting application is resource-expensive indeed. Thanks, Natasha! Very useful article. Have you tried UPX to compress final binary? It can compress final binary up to 2x. The main disadvantage of Electron is output file size. 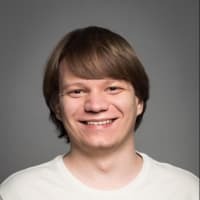 Greg is suppose to be doing a re-write for Vue CLI v3 but I haven't seen any updates from him lately. Very cool, I built a side-project with this exact setup + Firebase Auth, Storage and Firestore, such good dev experience and love love loved the flexibility of styling! 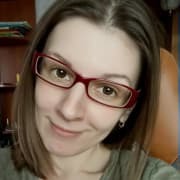 I read it very quickly but that would a good tutorial to go through and build my very first app with Vue. How to change icon desktop app for production? The most important "Con" for this kind of "apps" are the security implications though: Electron is a risk for your users. You would have to constantly update the underlying runtime all the time. tUx0r this is valid technically, but unnecessarily rude. Please try to deliver this feedback more constructively next time.